When the leaders of Russia, China, India, Brazil, and South Africa (BRICS) declared in July 2014 that they were creating a new international economic order with the formation of the New Development Bank (NDB), they were implementing an idea which had been originally conceived of and proposed by Lyndon LaRouche forty years prior, in 1975, in the form of the International Development Bank (IDB). 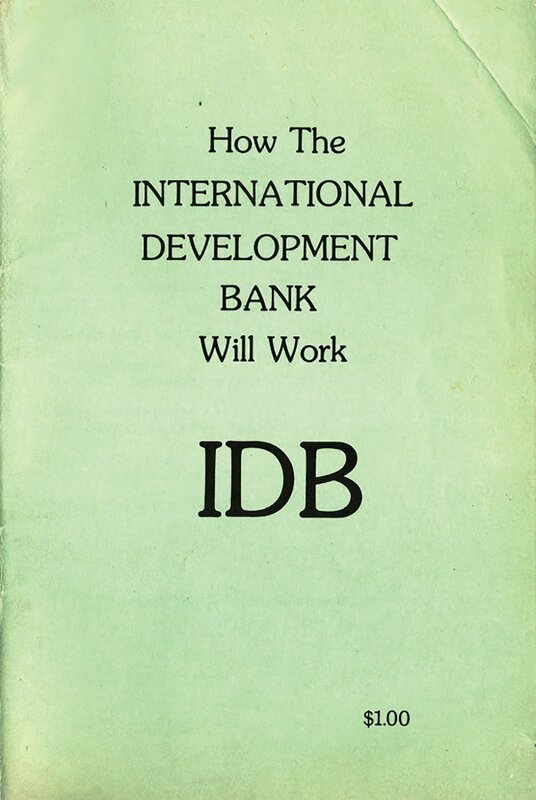 Policy document published by Lyndon LaRouche in 1975 detailing his proposal for creating an International Development Bank (IDB), a policy now being echoed by the BRICS. 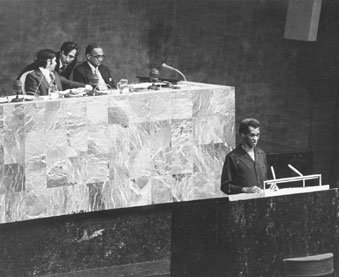 Within a year following LaRouche’s proposal, the Non-Aligned Movement representing eighty-five nations and two billion people met in Colombo, Sri Lanka and issued a unanimous declaration calling for “complete restructuring of international economic relations” and “the establishment of the new world economic order.” This included a call for a Bank of the Developing Countries, alternately called a Development Bank for the Third World. 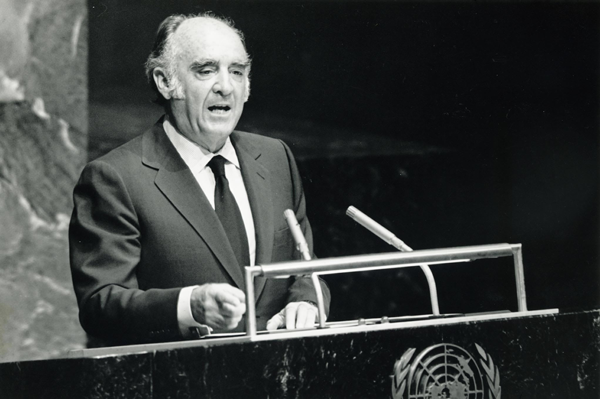 Frederick Wills, foreign minister of Guyana, calls for an international development bank and debt moratorium at the United Nations in September 1976. The IMF and the Bretton Woods monetary system must give way to alternative structures like international development banks... The crippling problem of debt and the servicing of debt has assumed a special urgency. We cannot afford to mortgage the future of unborn generations to the obligations of burdensome capital repayments and crushing debt servicing. The time has come for a debt moratorium. In the years immediately following, LaRouche became the focal point of efforts internationally to combat the murderous policies of the IMF system and bring into existence a new international economic order. LaRouche developed close relationships with the heads of state of many leading developing countries, including Prime Minister Indira Gandhi of India, and President José López Portillo of Mexico, meeting with them personally numerous times. 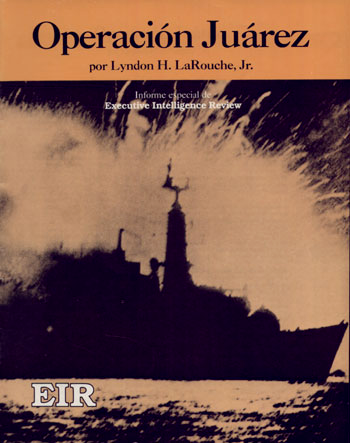 LaRouche's 'Operation Juárez' program for the nations South America, drafted at the request of the President of Mexico, José López Portillo. This bank will soon become one of the most powerful financial institutions in the world. If a sufficient portion of the Ibero-American nations enter into such an agreement, the result is the assembly of one of the most powerful economies in the world from an array of individually weak powers... The Ibero-American continent could rapidly emerge as a leading economic power of the world, an economic super-power. The most constant concern and activity of Mexico in the international arena, is the transition to a New Economic Order... It is imperative that the New International Economic Order establish a link between refinancing the development of countries that suffer capital flight, and the capital that has fled... Let us not continue in this vicious circle: it could be the beginning of a new medieval Dark Age, without the possibility of a Renaissance... We cannot fail. There is cause to be alarmist. Not only the heritage of civilization is at stake, but also the very survival of our children, of future generations and of the human species. Humankind is balancing on the brink of the collapse of the world economic system and annihilation through nuclear war. 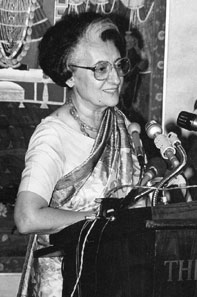 Prime Minister Indira Gandhi keynotes the 1983 Non-Aligned Summit in New Delhi, India." The eyes of the world are upon us. Let us decide here to usher in a New International Economic Order, to call for an International Conference on Money and Finance for Development. A thorough-going restructuring of the existing international economic order through a process of global negotiations is necessary. Non-aligned countries are committed to strive for the establishment of the New International Economic Order based on justice and equality. We propose the immediate convening of an international conference on money and finance for development, with universal participation, and a comprehensive restructuring of the international monetary and financial system. 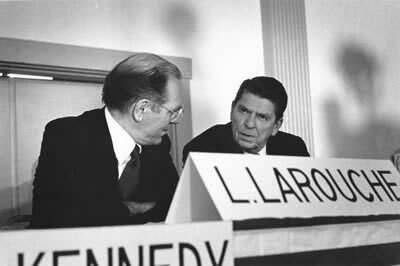 Lyndon LaRouche speaks to future President Ronald Reagan at a candidates forum in New Hampshire during the 1980 presidential election campaign. The policy unveiled in this historic announcement had come as the result of years of effort by LaRouche personally, developing the programmatic outlines of such a policy over the span of nearly a decade, and engaging in direct back-channel negotiations with Soviet representatives over the immediately preceding months—negotiations which LaRouche had conducted personally on behalf of and at the behest of leading members of Reagan’s national security team, reporting directly to the closest advisers of the President. LaRouche had been advocating a Manhattan Project-style crash program for the development of a joint space-based missile defense system based on new physical principles since the mid-1970s, in the context of his campaign for a new international economic order. The key principle behind such a crash program was economic at its core, as well as strategic. LaRouche emphasized that human survival depends fundamentally on constant up-shifts in technology and the energy flux density of power sources utilized in the productive process. A full-scale crash program for the achievement of thermonuclear fusion would be accompanied by a general surge in productivity which would be more than sufficient to lift the entire human species out of poverty. Such a global driver would be financed through credit provided by the International Development Bank and related institutions. When the Andropov government rejected Reagan’s offers of cooperation, LaRouche warned that the East bloc economies would collapse under the weight of the Soviet Union’s desperate military buildup by the end of the 1980s. LaRouche repeated this warning in a televised press conference in West Berlin in October 1988, in which he forecast the imminent breakup of the Soviet system and proposed a kind of Marshall Plan for the industrialization of Eastern Europe. Schiller Institute special report in German, "The Productive Triangle: Paris-Berlin-Vienna — Locomotive for the World Economy." With the fall of the Berlin Wall, Lyndon and Helga LaRouche immediately moved to put this plan into action, proposing to use the modernization of Eastern Europe as the “locomotive” for the economic development of Eurasia. 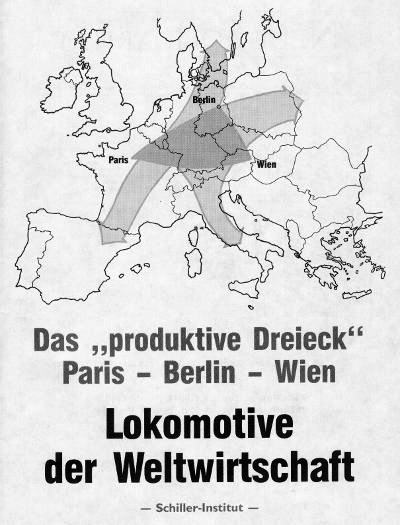 The concept took the form of the “Productive Triangle” linking together Paris, Berlin, and Vienna through development corridors. LaRouche proposed that such a development driver could be the cornerstone of a new, more just international economic order to replace the equally bankrupt and decayed Western free market system, which he warned was also on the verge of collapse. Following the official dissolution of the Soviet Union the following year, Lyndon LaRouche expanded the concept of the “Productive Triangle” to include the former Soviet territories in Russia and central Asia, as well as China, stretching all the way from the Atlantic to the Pacific coast. This proposal, which became known as the “Eurasian Landbridge” or the “New Silk Road,” would economically integrate the entire Eurasian continent, maximizing the productive potential of its territory and peoples for the common benefit of all, and resolving the artificially imposed strategic divisions among the great powers through the promotion of development in their mutual interest. Helga Zepp-LaRouche speaking at a 1996 international symposium in Beijing, China on the New Eurasian Landbridge. In 1995, Helga Zepp-LaRouche traveled to China to attend the “International Symposium on Economic Development of the New Euro-Asia Continental Bridge,” sponsored by the Ministry of Foreign Trade and Economic Cooperation of the People’s Republic of China. 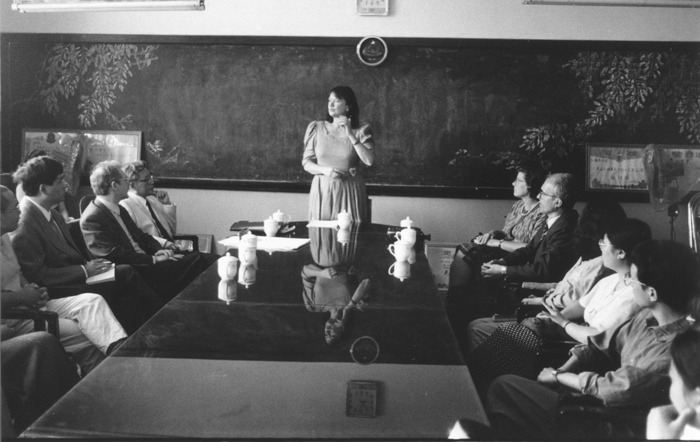 In 1998, Helga Zepp-LaRouche returned to China to participate in a second conference on the Eurasian Landbridge, called “Asia-Europe Economic and Trade Relations in the 21st Century and the Second Eurasian Bridge.” Through her role in promoting the concept of a New Silk Road internationally, she became known as the “Silk Road Lady.” Over the past year, Helga Zepp-LaRouche has returned to China twice to participate in several high-level seminars on the Landbridge, as well as being interviewed by numerous Chinese national media, both television and print, in which she has been recognized and celebrated as an original champion of the Eurasian Landbridge idea. With the announcement of China’s “New Silk Road Economic Belt” in September 2013 by President Xi Jinping, the Eurasian Landbridge became official policy of the largest nation on the planet. In the year since this initiative, the full scope of the new international order, first proposed in 1975 by Lyndon LaRouche, has come into focus around the BRICS, and now half of humanity is in the process of adopting the policies which Lyndon and Helga LaRouche have conceptualized and fought for over the past forty years. The role of Lyndon LaRouche and his wife Helga Zepp-LaRouche in providing the intellectual and political leadership for over four decades in the fight for a new international economic and strategic order for the planet, to end the historic imperial control of monetarism and unleash mankind’s creative powers as a species, is a testament to the power of human reason in shaping the history of mankind. It is an example of the dedication and leadership that every citizen must emulate if we are to follow through on the opportunity which has been given mankind to survive in the immediate future ahead. That survival is by no means guaranteed, but the very fact that the opportunity for survival now exists, is the direct result of the efforts of the LaRouche movement and its allies around the globe. It is now incumbent on the American people to act, and bring the United States decisively into this new international order, fulfilling our republic’s original mission for mankind and finally eliminating from this planet the system of empire, once and for all. The U.S. Must Join the BRICS!